Hedgehogs have nails similar to humans. Their nails are relatively clear and have a kwik at the end. Some hedgehogs will require their nails trimmed more frequently than others, (every couple weeks) but some hedgehogs wear their nails down during play and activity and might only need trimming once or twice a year. It is completely normal for different hedgehogs to have nails that grow at different rates. Long nails may also get caught on things increasing the risk of the nails being ripped or torn. The nails on the back feet seldom curl under, but if they are too long they can make walking difficult. A veterinarian should do the first corrective nail trimming if a hedgehog has nails imbedded in their feet or if the hedgehog has foot deformities. Playing with your hedgehog’s feet a lot during snuggle time and regular handling is a great way to get them used to people touching their feet. This is what we do with our horse and donkeys – we work with their feet before the trimmer comes so that they are comfortable at trimming time! There are many kinds of trimmers that will work for cutting your hedgehog’s nails. 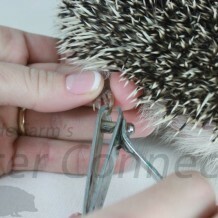 Specialty nail trimmers such as for dogs might be too big and awkward to use on your hedgehog. Cat clippers used for small dogs, cats, kittens, or small scissors used for hamsters or guinea pigs may be just the right size. Cat and small animal clippers can be found at local pet stores or online. Human nail trimmers can be found in the health and beauty section or the baby care section of most stores. The most important thing about trimmers is finding something that is comfortable for you. While trimming nails when your hedgehog is in water, it is good to have a non-slip mat in the bottom of the sink or washbasin so your hedgehog doesn’t slip and slide while struggling or with less than normal stability. Some hedgehogs like to snuggle in a warm towel after a bath. This might be an opportune time to pull a foot out of the towel without it even realizing what is happening. A wire basket like this one we found at Wal-Mart might also be useful in allowing your hedgehog to walk around so you can snag a leg. You can also let your hedgehog walk on your hands and allow a foot to drop in between your fingers and then “clamp” your fingers around the leg and you or a helper can trim the nails. Be careful not to twist the leg or over extend it. A firm grasp is good, but pulling and tugging could be dangerous. It is also helpful to gently hold the hedgehog’s foot for a little a while until the hedgehog starts to relax. A well-bonded hedgehog that is comfortable sleeping on you might not even notice a nail trim! After or during a bath are usually the easiest times to trim nails; because the nails are clean, softer, the kwik is easier to see, and the hedgehog is typically more relaxed. It is a good idea to cut only clean nails not only for good nail visibility, but also to reduce the risk of infection. Front feet are typically harder to cut than back feet. One must cut each front foot nail individually and be especially careful not to cut the pad of the foot while trimming. You should be able to see the small pink blood vessel (the quick) in the nail. You want to cut just after that. Depending on the type of trimmer you are using it may be possible to trim several back toenails at once because the toes lie closer together. Hedgehog toenails are clear or opaque similar to humans. Just like humans you want to cut the clear nails and avoid the kwik. Cutting a little at a time or just the curled tip is recommended if you aren’t confident in your nail trimming capabilities. Also, don’t be afraid to only trim one foot per nail trimming session. It is better to spread out the trimming if it is less stressful for your hedgehog than to try and get it all done at once. With some practice, quick reflexes, and patience you’ll get the hang of it! Knowing how far to cut can be a bit difficult as well. Be careful not to cut too close, you may cut the quick, which is extremely painful, or put pressure on it, which hurts as well. Hedgehog toenails have a blood vein that runs through the toe. Cutting the nail too far into the kwik or nail bed will cause it to bleed, but it will not cause permanent damage. It is a good idea to have a blood-stopping aide on hand while trimming the nails. You can use Styptic powder (this may burn), a blood-stop product such as Quik Stop, or simply dipping your hedgehog’s toenail in cornstarch or flour to help stop the bleeding. It is important to watch the hedgehog’s nails and feet for signs of infection for several days after a kwik has been cut. Hedgehogs that refuse to have their nails trimmed by the above mentioned methods might need their nails trimmed by a veterinarian under anesthesia. It’s much less stressful and cheaper to get the hang of clipping the nails at home. Even if a hedgehog does not allow you to trim its nails, you should be able to observe the nail length at bath time. Another way to observe a hedgehog’s feet and nails is to put it in a clear, plastic critter keeper and hold it above your head. The hedgehog is likely to come out of its ball especially if a special treat is available to tempt it. You can add a clean, disinfected garden or paving stone (provided your cage is large enough) or a clay flowerpot in your hedgies cage to help wear down the nails. This may not prevent nail trimmings, but it may increase the amount of time in between them. Over the years various websites and hedgehog enthusiasts have suggested using sandpaper in a hedgehog’s cage or wheel to wear down the hedgehog’s nails, so that manual trimming isn’t necessary. The idea is good in theory and may work for some hedgehogs, but one must use a lot of caution and pay close attention to your hedgehog’s feet. First, we recommend using fine grade sandpaper. This will allow a more gradual wearing down of the nails, which can be especially important for an active hedgehog that spends a lot of time on the sandpaper. One must keep a careful watch on the padding of the hedgehog’s feet and on the length of the nails. Too much time on the sandpaper might damage the pads and/or wear the nails down too short. One must also monitor the cleanliness of the sandpaper. Dirty sandpaper from feces or urine is dangerous, as it could greatly increase the chance of a foot or toenail infection.